It's Lent, so fish has been on my mind lately. During Lent (Ash Wednesday to Easter Sunday), Catholics around the world abstain from eating meat on Fridays- instead, they eat fish. In Southeastern Missouri (the boot heel) where I grew up, Lent is a great time of year because fish on Fridays equals the ubiquitous "fish fry". The local church, fire station, VFW, Elks Club, etc. get at many catfish as humanly (or humanely) possible, coat them in batter, and fry them up. Seriously, so good. In the boot heel, catfish is king. But this isn't the case everywhere in America. Last year, I attended a fish fry in Wisconsin that served bluegill, walleye, perch, cod, and haddock. Wisconsinites take the fish fry so seriously, they have whole websites dedicated to finding the perfect fish fry. I covet this fish fry. Wisconsin knows how to fry fishes! 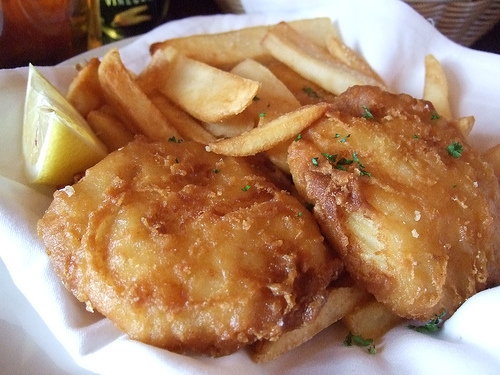 The fish fry is only one way that Americans have developed a cultural link with fish consumption. Americans prefer to consume certain varieties of fish for a wide array of reasons: on Jewish holidays, a common dish served is gefilte fish. Look it up: it's not my favorite but it's not totally the worst thing ever (I reserve that for pickled herring). Popular dishes such as whitefish salad (which I have a huge craving for right this moment), tuna salad, smoked salmon, and a billion other popular dishes available widely in delis and restaurants throughout the country. In addition to traditional dishes listed above, the healthcare profession continuously highlights certain fish varieties as "Power Foods". According to the Cleveland Clinic, out of three protein power foods listed, two are fish- salmon and tuna. The message, if you want to eat right, consume these two types of fish. So this is great, right? Eating fish is part of cultural and social life, and on the plus side, super good for you! Bad news though: often the most popular and "power"ful fish varieties are also the most over fished. In addition to the collapse of cod stocks, salmon and tuna stocks are also dangerously low. There's a trend: the fish that people want to eat are the stocks that are continuously struggling. Over-fishing to meet demand leads to a depletion of stocks. The obvious solution would be to just have people eat another type of fish until these stocks rebound. 79% of America's federally monitored commercial fish stocks are considered healthy and 86% of these stocks are not subject to over-fishing. In recent years, federal programs to rebuild stocks of scallops, bluefish, flounder, and lingcod have bounced back, and levels of ground fish remain plentiful in many fisheries. But it seems Americans want very specific types of fish, whether for cultural or health reasons. Even though there is significantly less cod and tuna to go around the US, it seems like restaurants are continuing to advertise. If diners don't know that these fish stocks are in trouble, they may not question if the 'cod' or 'tuna' on the menu is the real deal- but it turns out it probably isn't. A new study released by Oceana in Feb. 2013 concluded that 33% of all fish in the US was mislabeled (from samples taken at grocery stores, restaurants, and sushi bars). 87% of snapper was mislabeled (that's huge), as well as 57% of tuna. Halibut, cod, and grouper were mislabeled between 19 and 38% of the time. By far the largest mislabeling group are sushi restaurants: a whooping 74% of fish is mislabeled when you sit down for a meal of sushi. Most substitutions were for lower quality fish that have either been limited or banned in certain countries. Tuna was often substituted with escolar- a fish that contains a fatty ester that can cause extreme cramping and diarrhea if too much is ingested at one time. Several countries, including Japan, have banned the fish. Oceana's discoveries raised concerns because of the health hazards of consuming mislabeled fish, but it made me think about something else entirely: will people want to eat fish if it is not the variety to which they are accustomed? If a restaurant were to stop serving cod, because a. cod is really hard to get and they probably aren't really serving it anyway and b. not mislabeling the fish would make it cheaper for the consumer, would customers eat whatever other fish was offered? As stated above, not all fish stocks are depleted. In fact, some edible stocks, such as carp, are often taken to be garbage fish in America but are edible and actually destroying ecosystems because of their huge numbers. Why won't people eat carp? Missouri and Illinois have suggested catching carp, grinding it up, and making it into fish sticks to serve at homeless shelters. It's good- no one will probably know it is carp if you don't tell them. So if carp is okay to serve to people, and it tastes fine, why won't restaurants serve it? While media outlets portray outrage at mislabeling of food (horse meat instead of beef, escolar instead of tuna) it might be better to set the outrage aside and think about how the earth, and probably the economy, would benefit from finding and utilizing alternative sources of animal proteins. If we've overfished cod, tuna, salmon, and other fish, maybe we should look into popularizing new species. The American government tried this with carp in the 1930s, and was not particularly successful- but the food industry has quite a bit more power today. As do media outlets. I'd love to see a special in Women's Health detailing the carp or bluegill as a "power food". The department of commerce (in which the USBF was located) urged Americans to eat carp during the Depression. Fish fries highlight something very interesting about the intersection between culture and eating in America- At a fish fry, you are served whatever the most plentiful local fish was caught that week. Although you can go to a fancy restaurant and maybe get fish imported for your Friday dinner, the demand this time of year means people will eat their local fish. But will they do so the rest of the year, or do they expect imported non-native species in their fancier restaurants? Can we change the culture of consumer expectations regarding fish in America, and where do we start?